Chocolate Espresso Snowcaps – A chewy, chocolate cookie with a hint of espresso and then rolled in powdered sugar. They’ll remind you of little bites of brownie but with a little wintery snow on top. As promised, I am posting all-things festive through Christmas (and maybe even through December!). To recap, I’ve posted these monster cookies, these gorgeous cranberry lime mojitos, the mega-festive gingerbread biscotti, and the festive-because-it’s-in-a-festive-mug peanut butter hot chocolate. If these don’t scream “tis the season,” I just don’t know what does. Today, I am featuring my second favorite cookie to make during the holiday season, with the first being those monster cookies I mentioned above. Say hello to chocolate espresso snowcaps! These beautiful chocolate espresso snowcaps were introduced to me 5 years ago by, the one-and-only, Martha Stewart. Don’t you just love the snowy look they have on top?! Simply gorgeous. That’s my favorite thing about these cookies. Getting that perfect look can be tricky, but I give you some tips below so it get it right every time. My second favorite thing about these cookies is their chewy center with a slightly crisp edge. We can thank the brown sugar in the dough for that one. I under-cooked this batch slightly so it had a brownie-texture in the center. But if you don’t like that, cook all the way through. When doing that, you’ll get a chewier texture, like chocolate chip cookies. If you don’t love coffee flavor, don’t worry – the espresso is meant to enhance the flavor of the chocolate so you barely know it’s there. But you can easily reduce the amount of espresso so it’s not as noticeable, but still enhances the chocolate. I say 1 1/2 teaspoons should still do the trick. This is the most important tip of them all, so I am making it #1: you absolutely must roll the dough in powdered sugar twice, if not more. I think I ended up rolling it like 4 times to make sure the chocolate dough cannot be seen through the sugar layers. This ensures that the snowcaps stay beautifully white and sugar does not get absorbed into the dough. Do not skip the freezing step. If the dough does not chill, you are going to have a big mess of cookies. As you can tell in this pic, the dough is super sticky and unmanageable. Freezing it make it easier to roll in the sugar, and also ensures that the cookies don’t spread too much. Once the dough is chilled, you’ll easily be able to split the dough into even portions with this trick: cut the dough into four rows longways, and then 6 rows shortways. This will give you 24 even cubes of dough. You then roll each cube into a perfect ball that will get rolled in powdered sugar. Nifty, huh? This is when my math skills pay off. Since chocolate is the key ingredient in these cookies, you gotta make sure to use the good stuff. I would recommend buying a bar of your favorite semi-sweet or dark chocolate for this recipe. It really makes a difference. I hope you love these cookies! I surely do. What other festive treats will you be baking this coming week? This is the time when almost everyone is baking up a storm so I know you got some good stuff planned. Let me know in the comments below! 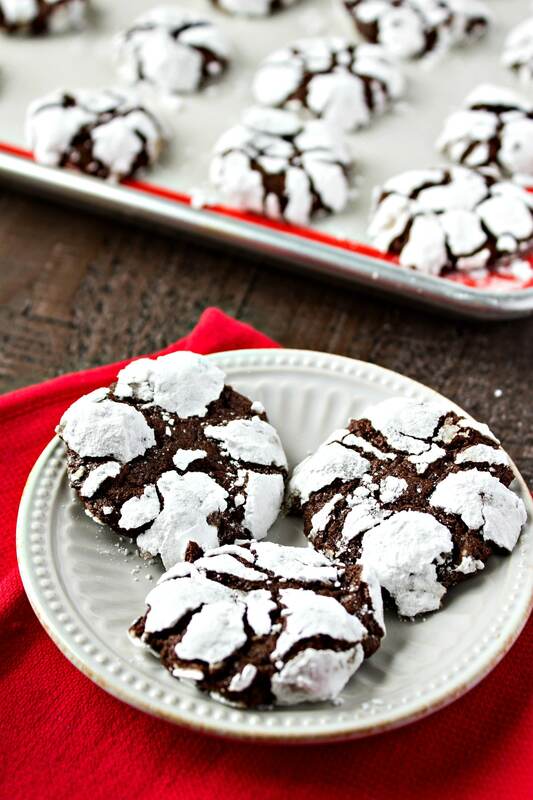 A chewy, chocolate cookie with a hint of espresso and then rolled in powdered sugar. They'll remind you of little bites of brownie but with a little wintery "snow" on top. In a small bowl, whisk flour, cocoa powder, espresso, baking powder, and salt so that they're combined. Set aside. In the bowl of a stand mixer, cream butter and brown until fluffy. Add egg and vanilla and mix until combined. Add cooled chocolate and mix until combined. With mixer on low, add flour mixture to wet mixture a little at a time. Let mix until incorporated. Add milk and mix until just combined. Lay out a sheet of plastic wrap. Place cookie dough into the center of the plastic wrap. Place another sheet of plastic wrap on top. Using your hands, form dough into a rectangle and completely cover in plastic wrap. Place rectangle into freezer until firm, about 45 minutes. Remove dough from freezer. Preheat oven to 350 degrees. Prepare two baking sheets with parchment paper. Unwrap the dough and place on cutting board. Using a sharp knife, slice dough into 24 even pieces. To do this easily, first cut 4 rows long ways and then 6 rows the opposite way. Add powdered sugar to a small bowl. Take one piece of dough and roll into a ball. Roll in sugar once and then roll again so that it is completely covered and no cookie is shining through. Do not shake off extra. This is key to keeping the "snow" from absorbing into the dough. Place dough ball on cookie sheet. Repeat with remaining dough. Make sure cookies are spaced 2 inches apart. Bake cookies in preheated oven for 12-14 minutes. 12 minutes will make them softer in the middle, 14 will make them a little chewier. The cookies will be done when they've spread and cracked and still lightly soft to the touch. Cool on a wire rack for 10 minutes. Storing tip: powdered sugar tends to absorb the flavors around it. So store these cookies alone and not with other cookies. Oh my goodness, these look SO good! Seriously good. I mean, some of that is due to your amazing pictures. Good job! these look AMAZING! I love espresso flavors in baking, saving on pinterest! These cookies look amazing! I love the chocolate/espresso flavor, so these cookies will definitely be making an appearance on my holiday dessert table, for sure. Anything chocolate and espresso sounds good to me! These look SO good! These look scrumptious! I bet a peppermint mocha version of these would be insane! Chocolate and espresso go so well together! These cookies look amazing. I need to add these to my list of things to make over Christmas. These look absolutely amazing! Thanks for sharing this great recipe. Christmas morning! Thank you for sharing! Love the addition of the espresso! Looking forward to giving these a try! Yum! Mmm! These cookies look delicious. And it would be fun to make these during Christmas break! YUMM! I’ve made these before, but not your recipe yet! I’ll have to try these this year 🙂 Thank you! Now that Christmas is almost here I have finally gotten around to doing some baking. These will be next on my list as they look absolutely yummy and easy to prepare. These look really good! Cookies with a brownie texture sound amazing! Holy yum! These would be perfect to bake for our neighbors. I wanted to find a good recipe! These look so delicious! I think I have to try them during holidays. Thanks for sharing! Yum! I love espresso and chocolate. I helped my son’s class make gingerbread cookies today. We’re planning to make sugar cookies this weekend <3. SO yummy- good tip on rolling the dough twice thru the powdered sugar! These look absolutely incredible. I can’t wait to try and make these! I pinned these immediately. Coffee and chocolate and cookies combined!? Yes! This looks so yummy! And so perfect for the holiday. Oh wow! This looks amazing! I bet my kids will love this when I try to do this for them. These cookies are so festive looking. They are the perfect cookie to bring to a cookie exchange! I really need these in my life. Cookies + Espresso … Yes! Please! I can’t wait to make these for Christmas! I’m planning to bake this weekend, so I’m excited to add this recipe into my list of cookies I’ll be baking! Thank you so much for sharing this–these look absolutely delicious! Of course! I just mention stand mixer for those who aren’t sure which attachment to use yet. You can easily make these by hand (using a whisk for the early steps and a spatula/spoon for when you add the flour) or with a hand mixer. Thanks for your question! Yes, I love the snowy look of these sooooo much!!! They look totally addictive and so festive! I also feel like I don’t know where this month went, it’s crazy to think Christmas is only 10 days away! I really don’t feel that festive yet!! Making snow caps are always a favorite cookie to make and share. Look wonderful so are perfect for a cookie exchange. Make great food gifts and always disappear fast. Exactly! You could even sub for almond extract if you want more flavor. Use just 1/2 teaspoon though. Espresso & chocolate in a cookie! A match made in heaven. Yum! These looks delicious. I’ll definitely be making these soon. Espresso and cocoa powders make for an amazing combination of flavors. As in, one of my favorites! Can’t wait to try these!